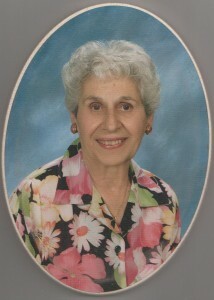 Marie I Fabrizio, 88; a native of Cortland and a resident of Fulton since 1948, died at home with her family at her side. Mrs. Fabrizio was a Registered Nurse graduate from E.J. Meyer Memorial Hospital School of Nursing in Buffalo, NY. She was a cadet nurse during World War II, and worked as a private duty nurse in Fulton, for several years. Previously, she had been employed at Providence Hospital in Washington, D.C. and Cortland Memorial Hospital. Mrs. Fabrizio with her late husband, Louis Fabrizio, operated the Fabrizio Cake Shop for twenty years until their retirement. She was a member of Holy Family – St. Michael’s Parish, and a member of its Altar Rosary Society. She was currently a communicant of Holy Trinity Church, Golden Agers Society and Altar Rosary Society of Holy Trinity Church, Fulton. Mrs. Fabrizio was a past member of the Catholic Daughters Court Pere LeMoyne # 833, Oswego County Catholic Nurses, and a charter member of the now disbanded Fulton Private Duty Nurses Association. She also served as a committee person with the Fulton Democratic City Committee. Mrs. Fabrizio was predeceased by her husband of over sixty years Louis Fabrizio, and her brother Palmiero Spaziani. She is survived by her daughters Elaine Angell, Cheryl (George) Thornber both of Fulton, and her son Gary Fabrizio of FL. In addition she is survived by a sister Louise ( Ron) Spencer of Fulton, and 7 grandsons: Nathan Angell, Marlo Angell-Jasso, Matthew Ilacqua, Derek Brett, Gavin and Jared Thornber, and Alexander Fabrizio, 5 great granddaughters, 4 great grandsons, 2 great great grandsons, 1 great great granddaughter and several nieces and nephews. Funeral services will be conducted 11:00 am Friday from the Sugar Funeral Home 224 W. 2nd. St. S. Fulton, and 11:30 AM in Holy Trinity Church, Fulton where a Mass of Christian Burial will be celebrated by Rev. Moritz Fuchs. Calling hours will be held Thursday 4:00 – 7:00 p.m. at the Sugar Funeral Home, Fulton. Burial will be in St. Mary’s Cemetery, Cortland, NY with Rev. Lucian of St. Anthony’s Church, Cortland, NY. Donations may be made to the Friends of Oswego County Hospice, PO Box 102, Oswego, NY 13126; and St. Jude’s Children Research Hospital, 501 St. Jude Place, Memphis, TN 38105-1942. To all: I will miss Aunt Marie (Flower) as Uncle Louie used to call her. It was always wonderful seeing her when she came to Florida. Chris and I will always remember that Aunt Marie & Uncle Louie made our wedding cake and cut it for us. I will miss her so much. I do beleive now she is dancing in heaven with Uncle Smokes. Our prayers are with you all. I will also miss her letters comming in the mail. It was so wonderful to read them, and then give them to Kelli to read. Everyone who know her will miss her always. Aunt Marie will be missed by everyone. I will miss her comming to Florida to see us all. I do beleive she is now dancing in heaven with Uncle Louie. Chris & I will always remember that Flower & Smokes made our wedding cake. We will also miss her wonderful letters she used to send to us. I will never forget you Aunt Marie. Words cannot express how sad I am and how much I will miss Aunt Marie, your beloved mother. She was one of those rare, genuine individuals who I believe God placed here on earth as saints. I also believe she is now in heaven with Uncle Louie & my mom. I will forever cherish her handwritten letters abounding with love and so much more. My prayers are with you and may your loving memories of her fill you with comfort in the days & months ahead. To all in the Fabrizio Family. I am sadden as you all are at Marie’s passing. I will miss our wonderful lunches at the Blue Moon. She was a bright light in this world for me. Gary, thank you so much for giving me the chance to call and say goodbye to Marie. You all will be in my thoughts and prayers at this very difficult time for you. MARIE WAS A VERY NICE LADY AND HAD A STRONG FAITH TO HER RELIGION. WE WILL MISS HER.